We are giving our followers the chance to win a unique hand embellished Kristjana Williams original artwork worth £1200! 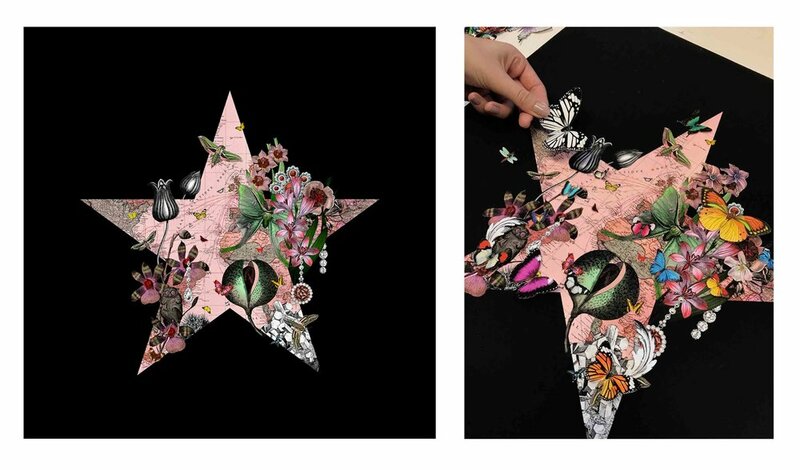 Moss Star is a new edition produced exclusively for the Art Car Boot Fair Christmas Wrap Party and the winning entry will receive a very special, unique hand embellished version, framed and ready to hang on the wall.The Prize Draw opens for entries at midday on Saturday December 1,2018 and closes at 23.59 on Friday January 4, 2019. 1/ Download the Vero app on your iPhone or Android device (links below) and create an account. 2/ Follow ‘@Art Car Boot Fair’. 3/ Upload an image that embraces your interpretation of the theme of 'The Star’ to your account. 4/ Tag @Art Car Boot Fair and use the hashtag #ACBFSTAR in the caption of each post for a chance to win. You can enter up to ten times from your Vero account. Kristjana Williams is an Icelandic artist who works with intricate collage, often overlaying exotic flora and fauna onto cartographic backgrounds. Kristjana also creates fantastical creatures by fusing butterflies, tropical birds and exotic plants. There is a touch of magic to her work and her work has soared in popularity over recent years, with commissions for the likes of British designer Paul Smith and Liberty, installations for hotels and exhibition centres in Shanghai, Hong Kong and at The Shard in London and she recently designed the latest album cover for Coldplay. More information on the KSW website here.